Bled dry by warfare, the vast Malazan empire simmers with discontent. Sergeant Whiskeyjack’s Bridgeburners and surviving sorceress Tattersail wanted to mourn the dead of Pale. But Darujhistan, last of the Free Cities, holds out, Empress Lasseen’s ambition knows no bounds, and the gods intend to intervene (goodreads.com). 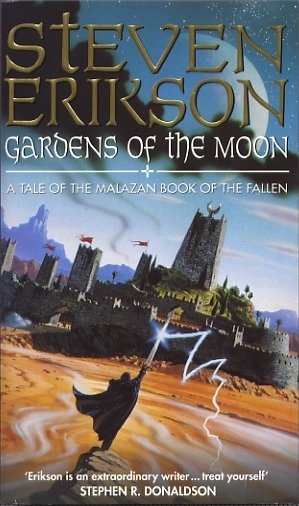 Garden’s of the Moon is one of the best fantasy books I have read! It is right up there with George R.R Martin’s, A Song of Ice and Fire series, as well as Glen Cook’s, Chronicles of the Black Company. I can’t wait to read the rest of the series!, however this book could easily stand alone, but you will be wanting more! Garden’s of the Moon is by no means an easy read. It takes a lot of time to get through the book and even when you are 3/4 of the way done, you still may be confused. There are just so many plots, characters, races, and places it is hard to keep up with it all. I found myself looking at the character list as well as the glossary during every chapter. It did take me over 100 pages to get into it, but I am glad I stuck with it. I was constantly confused. I had to look up chapter summaries just to make sure I wasn’t missing anything. Turns out you really aren’t supposed to know what is going on from the beginning. Erikson’s book is definitely plot driven and complicated. As you read you will be confused, but there are clues that can help you understand. You have to figure it out based upon conversations and actions. Who is fighting who and why? This is what kept me interested! I wanted to know why! Most of the questions are answered by the end of the book, so I wasn’t confused too much after finishing it. 🙂 Just read slow and look at the provided glossary as you read and you will enjoy it! I couldn’t believe the world that Erikson built for his book! There is tons of history spanning over 1000 years, as well as hundreds of different places, people, and races. It is so incredible, vivid, and well described! There was enough detail provided that you could picture it, but not so much that it drags on forever. Erikson chooses his words very carefully; there is no filler in this novel! I couldn’t believe how well the battle scenes were described! I felt like I was actually there. There were also instances where you get descriptions about the aftermath of some brutal battles and I was just disgusted. I felt like I was walking through the scene just as the character was. Unlike most novels where you have good vs. evil, in this novel that is rather difficult to determine. It seems like there is just a lot of gray areas, which is a good thing in my opinion. Makes things a little more real. No one is solely good or bad. I can’t even begin to explain the magic system in the book, and neither does the author. You have to figure it out as you read. I don’t want to give it away because that is the fun of reading this book, but I can say that it is very interesting and different than a lot of other novels! The only downfall of the novel, besides it being confusing, were the characters. Erikson’s novel is so plot driven that he leaves little room for character development. There are just so many characters to begin with that are important in the novel, I wouldn’t know where to begin! I felt like I just couldn’t connect to any of the them, which makes the book a little less interesting for me. However, I was distracted by trying to figure out the plots, so I’m to too upset over the lack of character development. I can’t say that the development was horrible, it just wasn’t as good as I expected, though there are many other books to the series, so maybe it gets better. If you are looking for a book that is not filled with the typical fantasy cliches, is really plot driven and complicated, and you like to think quite a bit when you read, then I would definitely read this book! Even if you don’t like these things I would still suggest giving it a try. I don’t like books that are confusing, but I have to say that I really liked reading something different and trying to figure out what was going on as I was reading. Update: After reading most of the series I really suggest reading this with someone else or at least following the summaries and discussions for each book found here. It will really help in understanding each novel and you will get so much more out of it. Also, I would spend an entire month on each book reading only a chapter or two a day; it really isn’t a series you can rush through. Definitely worth all the time though! It’s incredible! There is also a great list of characters and other information on the series’ wiki site, but it does contain spoilers! Check out these other reviews to get different opinions!